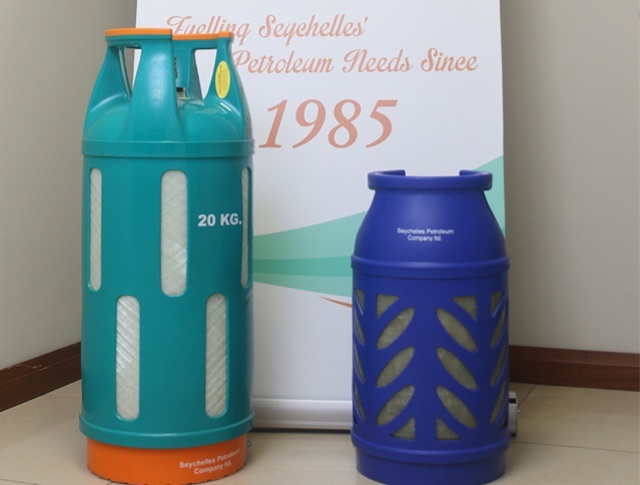 (Seychelles News Agency) - The Seychelles Petroleum Company (Seypec) introduced new cooking gas cylinders on the market on Monday that are aimed at gradually phasing out steel cylinders currently in use, says a company official. Seypec’s Operations and Technical Manager Ray Hoareau on Friday told SNA that the introduction of the new composite cylinders have been in the pipeline for several years mainly due to the high maintenance cost of steel cylinders. “We spend a lot to refurbish our steel cylinders or to scrap them because of corrosion, so this new cylinder will give us an advantage and obviously our clients will also benefit from this because they will get a clean cylinder,” Hoareau told SNA. Liquefied petroleum gas (LPG) was introduced in Seychelles, a 115-island archipelago in the western Indian Ocean, in the early 1990s for domestic and industrial use. The aim was to replace kerosene, which was widely used for cooking in the island nation. Seypec is targeting both domestic and commercial customers with the new composite cylinders. However, compared to the current 4.5 kg, 9 kg and 12 kg steel cylinders mostly used by households, the new gas containers are available in 5 kg and 10 kg. For industrial use, the previously used 24 kg and 48 kg steel cylinders are being replaced by a 20 kg composite cylinder. While the 10 kg and 20 kg cylinders are already available on the market, the smaller 5 kg ones will go on sale as of mid-December. Seypec’s Commercial Manager, Sarah Romain, told SNA that as some of the steel cylinders are still in good condition it will take around 15 years to completely phase them out. “People do not have to rush to get the new cylinders as the phase-out period will last around 15 years, except for the 48 kg cylinders which will be phased out quicker. Industrial customers will have six months from January next year to return the 48 kg cylinders to Seypec,” said Romain. Compared to the steel cylinders, the new composite ones are more colourful and are made from high density Polyethylene -- a petroleum based material. They are also rust-free, transparent, and explosion-proof with a longer life span of around 25 to 30 years. One other feature is that the new containers are half the weight of the steel ones, something which Seypec said will reduce the risk of injuries for its staff while handling and transporting the cylinders. The composite cylinders which have been sourced from Norway and India are on sale of the Seypec headquarters. Romain explained that the price of LPG gas remains the same at $1.25 per kg [17 Seychelles rupees]. However, customers will notice that there will be an increase in the price one has to pay as deposit when exchanging their steel cylinders to buy a new composite one with Seypec. “The [composite] cylinder is also more expensive for Seypec to buy, so a 5 kg composite cylinder will cost SR200 [around $15], a 10 kg one will cost SR375 [around $28] and a 20 kg cylinder will cost SR500 [around $37],” said Romain. Seypec has 12 LPG tanks on the Seychelles main island, Mahe, and four on the second most inhabited island, Praslin which provide storage for six months’ worth of cooking gas consumed by the country.